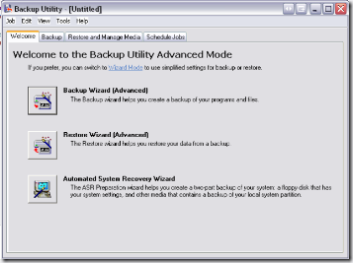 XP Home - Backup Utility! Within 24 hours I had two separate conversations about PC crashes that resulted in the loss of nearly all data. This got me frightened, and realized that I have not completed a legitimate backup of my system since I upgraded my PC's hard drive. For a quick and dirty solution all I actually needed was to backup my digital music files so that I could recover from a catastrophic hardware failure. As I had no money in the budget I decided to rely on the XP's Backup Utility. Now with XP Home Edition this is not installed by default and will have to be updated manually. You do this by going to D:\VALUEADD\MSFT\NTBACKUP on the XP Home CD and installing the NTBACKUP.MSI. XP Professional will have this installed by default. I did not use the Wizard but the Advanced Option is pretty straight forward. 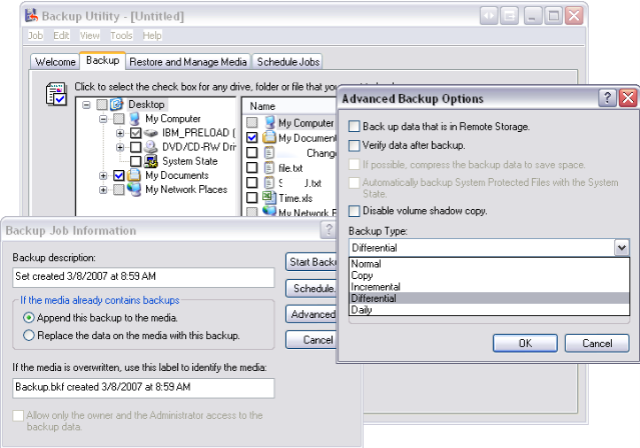 Select the folders that you want to backup and/or the System State and away you go! To backup my critical files, which include a metric crap load of wave files (and excluded system state), took an 1 hour 48 minutes. At almost 14 gb of information that was not bad at all. If you are so inclined this application can be set up from the command line, but I did not have the time to get into that ... the sky was falling for me! 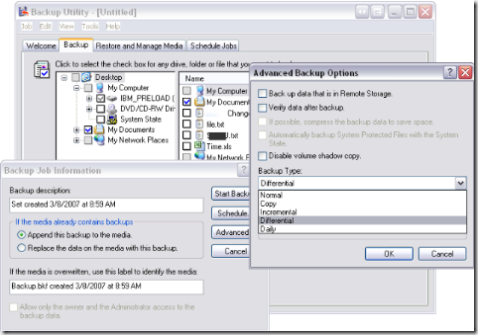 The biggest drawback for this solution is that I could find no way to make the backup file conveniently sized for burning to CD, however, as I have an additional drive connected this was no big hassle for me. 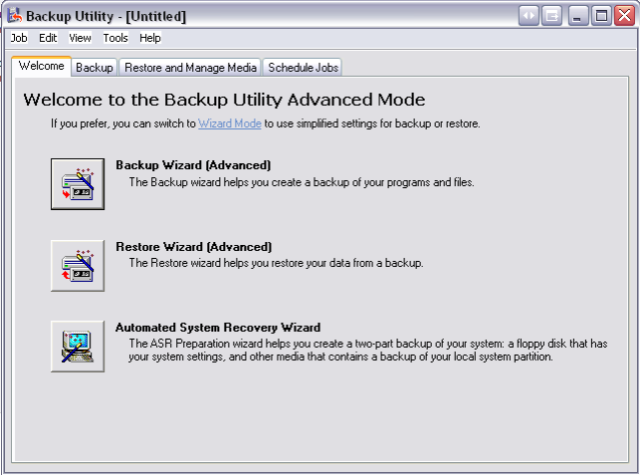 Backup Utility also gives you the opportunity to Append or replace the backups, and also provides the ability to execute Incremental and Differential backups. There remains no excuse for anyone out there to lose critical data! Unless you have the resources for a RAID configuration you may want to consider this stop gap solution!